Illinois Gov. J.B. Pritzker speaks at a state Capitol news conference Wednesday, Jan. 23, 2019, in Springfield, Ill., as state Treasurer Michael Frerichs looks on. 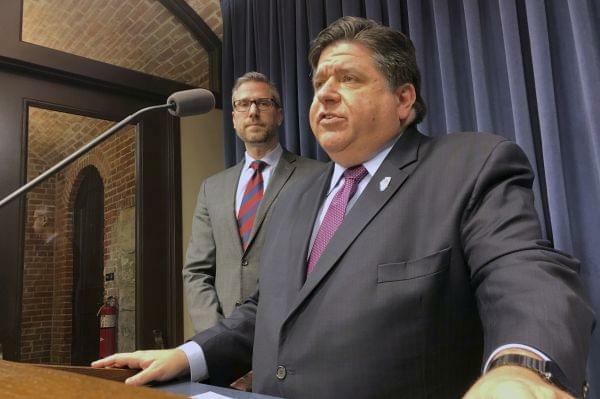 The Democratic Illinois state officials are offering $100 million in low-interest or interest-free loans to federal workers going without paychecks during the record 35-day government shutdown. On The 21st: Illinois is home to some of America’s most segregated cities. Not just Chicago, but also Peoria, Rockford, and Springfield. Plus, have you checked this week’s forecast? Lots of us are going to see below zero temperatures. Meteorologist Andrew Pritchard helps us prepare. But first, the government is finally open after the longest shutdown in American history. And the state of Illinois wants to fund a hundred million dollars in low or zero-interest loans to people who’ve been affected. How much savings do you have for emergencies? Hundreds of thousands of workers and contractors have been dealing with the fact that their employer, the federal government, was shut down for 35 days. About 12 and a half thousand federal workers live here in Illinois and those workers have missed two entire paychecks. Now that the government has been reopened, they’re likely to get paid by Friday. But if you’re a federal contractor, you’re not getting back pay. Over the last week, Illinois organizations have been stepping up to provide some help, whether it’s food banks, credit unions, or even the state government. Christine Vitel is a TSA officer at O’Hare International Airport. She lives in Justice, which is a suburb on the city’s South Side. Last week, Treasurer Mike Frerichs and Governor J.B. Pritzker announced that they’d try to provide some help in the form of a hundred million dollars to banks and credit unions to provide low to zero percent interest loans. Treasurer Frerichs joins us in our Urbana studios. Greg Anderson, senior vice president of the University of Illinois Community Credit Union, also speaks with us. "4 in 10 Americans cannot cover an emergency expense" says @ILTreasurer. That’s what Dan Vock and Brian Charles write in an investigative series for Governing Magazine. And what they say “heartland,” they don’t just mean the Midwest, they mean some of central and northern Illinois’ biggest metro areas. The numbers back it up. Illinois cities are some of the most racially segregated in the entire country even though housing discrimination has been illegal since 1968. Peoria, Rockford, Springfield, Danville, and Kankakee are all within the top one-third. And in some metro areas, segregation hasn’t changed much since the 80s. Some of this is because of our country’s long history of discrimination. But it also has to do with state and local policies in our much more recent past. Dan and Brian’s four-part series is called Segregated In The Heartland. They wrote it for Governing Magazine in Washington and they join us on the line. “America’s racial divide runs right through the heartland.” - @danvock @JBrianCharles on IL Segregation. All across the state, temperatures in the single digits and negatives this weekend kept Midwesterners humble. And if you haven’t heard already, it’s only going to get worse. So what can you expect and how can you be prepared? Champaign-Urbana meteorologist Andrew Pritchard speaks with us in the studio. "It's colder in "x midwest city" today than Anchorage, Alaska!